The tomb (TT 1) of Sennedjem in the necropolis of Deir el-Medina on the West Bank at Luxor (ancient Thebes) was actually one of the great discoveries, found in tact by Italian archaeologists in 1886. Nothing had been disturbed, as was not even the case with the tomb of Tutankhaman. Today the funerary equipment, mostly made by the workers themselves, is displayed in the Museo Egizio at Turin. Almost all of the decorations within the tomb, painted on a background of yellow ochre, are perfectly intact, and considered some of the most beautiful within the necropolis. Sennedjem had the title, "Servant in the Place of Truth", and lived during the reigns of Seti I and Ramesses II of Egypt's 19th Dynasty. 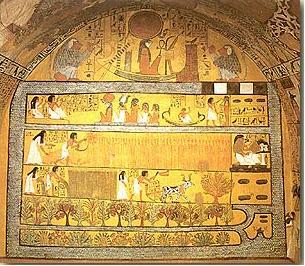 The tomb is very simple, with a narrow stairway leading into a small room followed by the burial chamber. 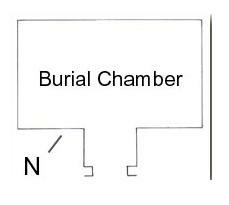 The rectangular burial chamber is oriented westward and has a vaulted ceiling. The tomb originally had a wooden door opening into the first, small room, with a scene depicting Snnedjem and his wife, Lyneferti playing the board game, Senet. 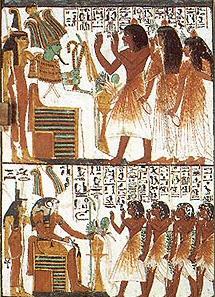 The game is spiritually connected with Chapter 17 of the Book of the Dead, and may represent the Judgment of Osiris. On the other side of the door we find Sennedjem and his relatives worshipping Osiris and Maat in the upper register, and Ptah-Sokar-Osiris and Isis in the lower register. The style of decorations in this tomb or typical of the Ramessid period, being spontaneous and fresh, with lively details. They represent a conventional funerary theme. Entering the burial chamber, on the left front wall we first find a scene depicting the mummy of the deceased in his sarcophagus lying on a funeral bed and protected on the left by Isis and on the right by Nephthys, both in the form of falcons. Under this in a lower register is a scene of the deceased sons bringing him offerings and purifying themselves before his parents while other relatives sit nearby. In the next scene on this wall, the deceased is shown with his wife and is holding a sekhem-scepter, a symbol of power. Turning the corner, we encounter a scene of Snnedjem and his wife worshiping the gods of the dead below a dual representation of Anubis in the form of a jackal crouching on a shrine. On the back wall we find scenes of the deceased entering the afterworld. 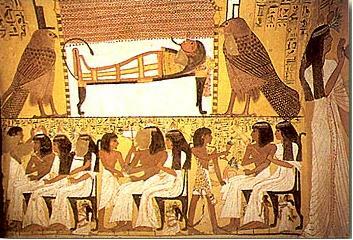 First Anubis preparing Sennedjem's mummy, which is stretched out on his funeral bed. Here we also find text from the Book of the Dead. In the next scene we find Osiris, in full regalia, before an alter on which rests a water pot cooled by lotus blossoms. On either side of him are Wadjet-eyes at the top and two sacred fetishes below. Apparently, in the following image, Sennedjem worshiping this image of Osiris. Finally, on this wall we find Anubis in human form but with a jackal's head introducing Sennedjem into the afterworld. Turning the corner, again we find a number of scenes including one very famous depiction of the Fields of Laru in the blessed afterworld where the deceased and his wife sow, reap and plow reflecting chapter 110 of the Book of the Dead. 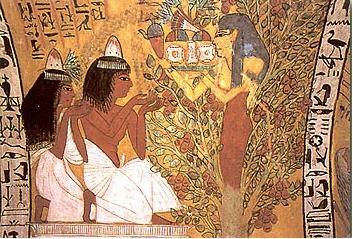 Above this scene we find Sennedjem and Lyneferti worshiping Re, Osiris and Ptah. They are followed by a boy on a papyrus boat who was most likely a dead son of the couple, and one of the deceased sons performing the Opening of the Mouth ritual on his father. At the top of the wall is a scene of baboons worshipping Re on his bark (boat). On the front right wall there is a scene of the deceased and his wife facing the guards of the gates of the kingdom of Osiris. The roof is also decorated with text running down its middle with three strips crossing it, dividing the ceiling into two groups of four squares. In the first square are scenes of the deceased worshiping different divinities, including Thoth, Re-Herakhty and Atum, along with others. In the next box is a scene depicting Sennedjem and Lyneferti receiving offerings of food and beverages from the goddess of the sycamore. This is a representation of the goddess Nut in her role as protector of the dead. These scenes are followed by others representing the couple worshiping four stellar spirits, the benu-bird, the embodiment of the soul of Re, the couple with Re-Harakhty and the members of the Heliopolitan Ennead, and of Sennedjem opening the gates of the West, Osiris' Kingdom. This is truly one of the great private tombs in Egypt and is not to be missed if visiting the West Bank at Luxor.